After 3 weeks in the Phoenix area, I think we were ready to move on. Not because we were unhappy there, or that we didn’t like it. It was just time for a change. Time to do something different. After all, this trip was supposed to be about seeing and experiencing all kinds of new and different things. So, we were primed for change. 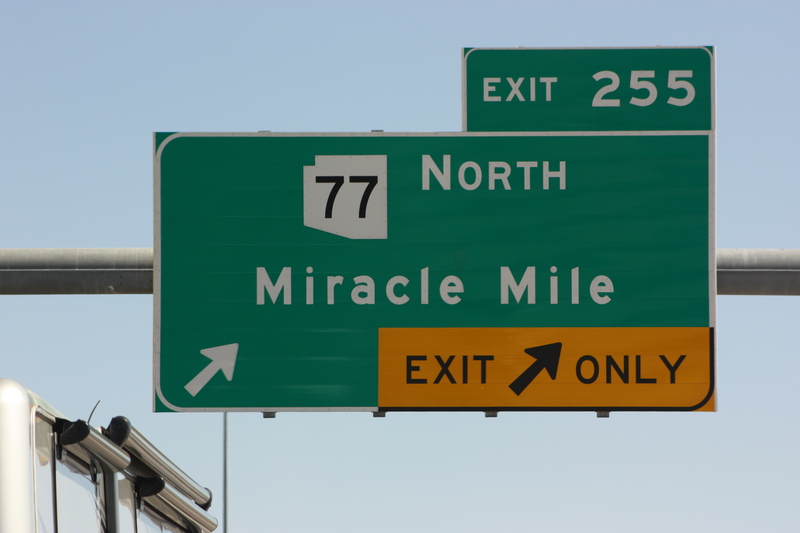 As we approached Tucson from the north on the I-10, I began looking for the exit that said “Miracle Mile”. I had read that it was the primary automotive corridor into the city throughout the middle of the 20th century, and it had been written about using much of the same language that had been used to describe Route 66 – “Iconic flickering neon signs and art deco design on hotels and restaurants, that created the first impression for visitors to the city”. We turned off at exit 255, and we expected to be taken back in time. Unfortunately it reminded us more of the eastern-most end of Kingston Road in Scarborough, Ontario, and much of what remained from the 50’s looked like it had seen better days. Perhaps we would have been more impressed if we had seen it at night, as there are roughly 20 buildings that apparently still have original neon signs that light up. Sadly, the light of day didn’t do the Miracle Mile any favours as far we were concerned. 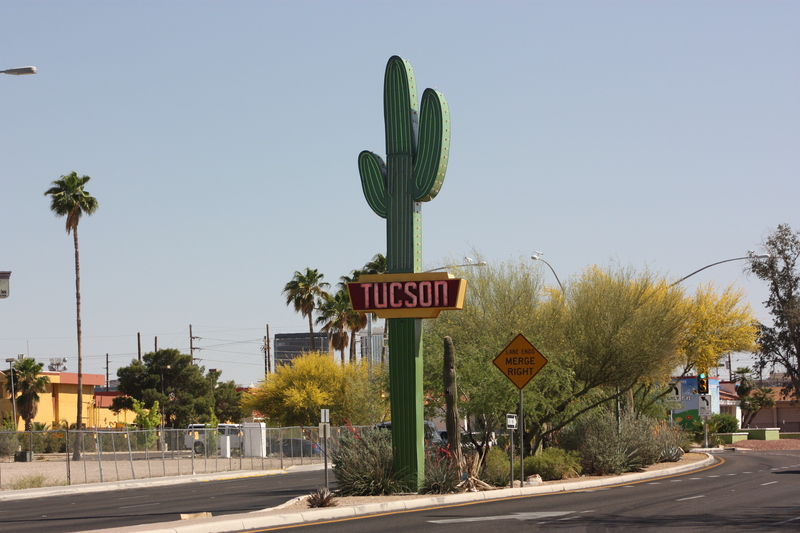 As we approached the downtown corridor, there was one piece of art deco design that absolutely captured our attention – the Gateway Saguaro, that stands 30 feet tall, and welcomes visitors to Tucson. It is however not a historic sign but rather a piece of work that was commissioned, built, and erected in 2010. It may not have been old, but we thought it was pretty cool looking, and certainly representative of the Arizona experience that we have had. 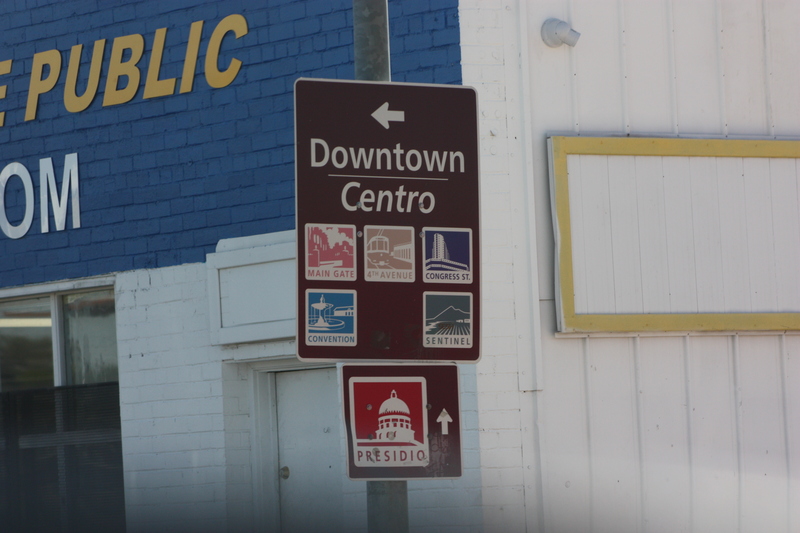 It was also quickly apparent to us that Tucson was very much in touch with its Mexican roots, heritage and history, and that many signs on the streets and on buildings, were “bi-lingual” in nature. Each time we enter a city for the first time, we try to take a “first picture of the skyline” for the sake of posterity. 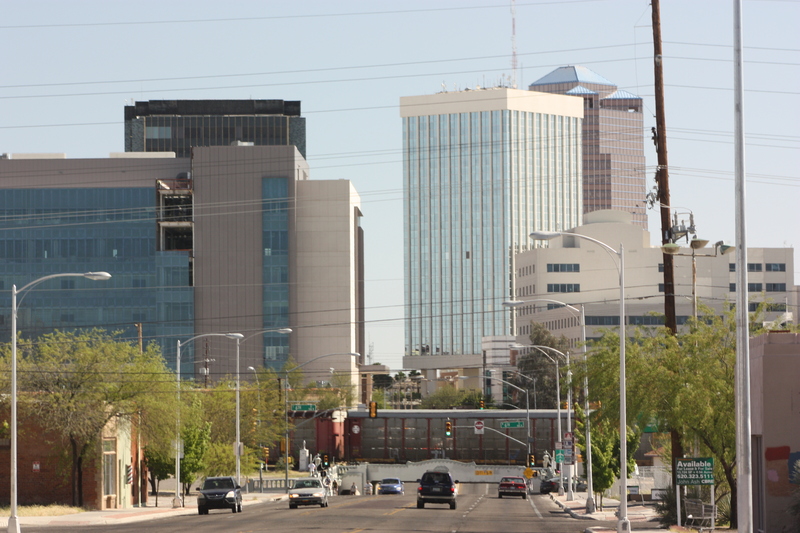 It isn’t always feasible due to trees, telephone and electrical wires, and more often than not, awkward vantage points, but in the case of Tucson, it was nicely laid out in front of us and it looked quite clean and modern, although “small” in comparison to other “downtown” corridors we’ve seen. 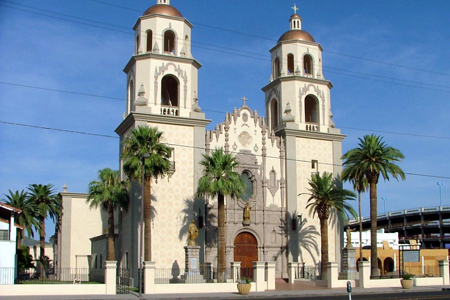 We hadn’t yet made reservations for the night, so I asked Mary to pull over to the side of the road, and we parked in front of a beautiful church in downtown Tucson – St. Augustine Cathedral. While we sat there with the windows down (it was close to 30 degrees Celsius), for the first of many times on our trip, I dialed up Trip Advisor, and one of the first hotels that caught my eye was “The Arizona Inn”. It had received very high scores from a lot of travellers, and the reviews were replete with comments like this. “We stayed here recently as part of our grand road trip around the South West USA. We only stayed two nights and wished we could have stayed longer as it was an oasis of calm and sophistication. We stayed in a deluxe room which was large, comfortable and quiet. The hotel facilities are excellent. The complimentary afternoon tea was lovely”. “This property was memorable is so many ways. It makes a great first impression with all the flowers and green grass, yes, along with the cactus gardens. The classic pink adobe and deep blue screen doors and shutters was very impressive. We dined on the patio and the food was very good along with the presentation. I loved the quiet pool and the setting was as it it was from the olden days”. I checked out the room availabilities and found that there were “guest cottages” decorated with the original furniture from when the Inn first opened in 1930. At $199/night the price was a bit more than I had budgeted for (I budgeted an average $130-$150 U.S./night before taxes), but it sounded so inviting. I figured what the heck, we’re looking for some unique and original experiences and this sounds really, really neat. I’m going for it, and I booked us in for two nights. 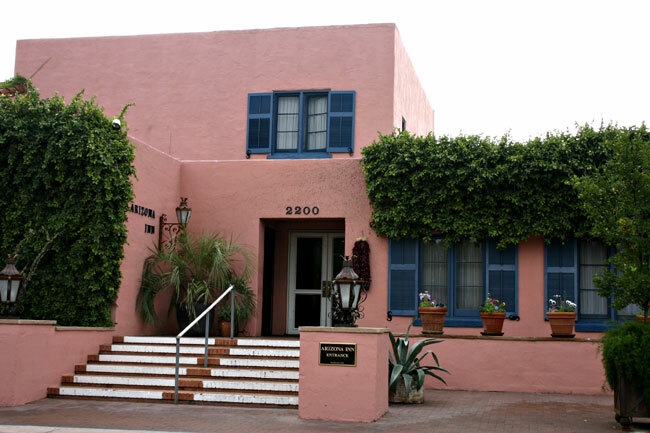 It was with great anticipation, that we pulled away from the curb and made our way to the Arizona Inn.